The UK is experiencing a slower economic recovery than 23 of the 33 advanced economies monitored by the International Monetary Fund (IMF), according to new analysis published by the TUC on 9th May. The research, which comes as the IMF begins its two week visit to Britain today, says UK income per head – economic growth that takes account of population change – will not return to its pre-crash level until 2017. By contrast, income per head in Germany and the US will be over 10 per cent higher a decade on from the financial crisis, while South Asian economies are set to have growth of over 20 per cent. The TUC says the figures, which are based on the IMF’s latest GDP forecasts, reveal that the UK risks enduring a ‘lost decade of growth’, while many of its economic rivals forge ahead. With the Chancellor identifying an economic ‘global race’ as the defining challenge for the government, the TUC report shows how George Osborne’s own strategy is causing the UK to fall behind its competitors. The study also reveals how the UK is emerging from recession at a slower rate than at any time in its recent history. In 1985, UK income per head was six per cent higher than it was before the 1980 crash. In 1995, UK income per head was seven per cent higher than it was before the 1990 recession. UK income per head is today still six per cent below its 2008 level. The Chancellor cannot blame Europe for the UK’s economic woes, as the vast majority of the Eurozone’s countries are performing better, says the TUC. George Osborne faces further embarrassment this week when he hosts a meeting of the G7 finance ministers on Friday. Only Italy are experiencing a slower recovery than the UK among G7 countries. Recent TUC analyses of the ‘global race’ – available at www.touchstoneblog.org.uk/tag/global-race – have found that the UK is lagging behind most of its G7 competitors on exports, wage growth and manufacturing too. George Osborne must heed the IMF’s recent call for the UK to ease off austerity and follow the example of the US by investing in jobs and infrastructure, says the TUC. The TUC wants to see a large jobs and infrastructure stimulus, including a jobs guarantee and an extensive house building programme to get growth and confidence back into the economy. TUC General Secretary Frances O’Grady said: ‘We truly are experiencing a lost decade for growth. ‘While other countries are already seeing a rise in economic output, the UK won’t return to its pre-crash level for another four years. 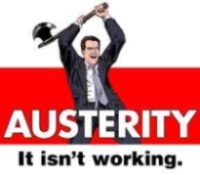 ‘The Chancellor’s commitment to self-defeating austerity has prolonged people’s suffering and put the brakes on our economic recovery – so much so that escaping a triple-recession is considered by some to be a cause for celebration. ‘Even George Osborne’s favourite economic institution, the IMF, is calling on him to change course. Without a fresh approach we will continue to trail our economic rivals and bring up the rear in the global economic race. The warning signs have been there for some time. Last month one poll showed that the general public has lost confidence in politics providing solutions to the failing economy. More recently opinion polling showed antipathy to all things Europe, amplified by anxieties about a contagion of struggling EU economies. This anti-politic dynamic gains traction from the Coalition dogma that there is ‘no alternative’ to the course they are plotting; that austerity is the natural and only response to the fiscal and monetarist challenges exerted on the global economy. It’s easier, their theory goes, for the social and economic devastation inflicted by their undiluted assault on public spending and public services to remain unchallenged if we believe it is ‘out of their hands’ and they have no choice. One side-effect of this deliberate denial of culpability, this refusal to accept ownership of or responsibility for the outcomes of their choices as a government, is a diminishing faith in politics and politicians being seen as part of the solution. The consequence of that is democratic fracture and an increasing tendency to withdraw support for mainstream political parties – either through not voting at all or, as was demonstrated last week, by voting for what is essentially a protest party that says ‘no’ to many things, but not much about anything else, a party that stands on a platform of incoherent, impractical and inherently flawed, ill-thought policies. This anti-politics combined with anti-Europeanism created a perfect storm for UKIP and they maximised benefit to them, aided and abetted by an increasingly eurosceptic Tory Party and an inherently right-wing media. It would be wrong, though, to suggest that their message, however superficial, didn’t resonate in some quarters with a voting public deeply frustrated by the failings of the current government and yet to be sufficiently convinced that ‘One Nation’ Labour are offering a strong enough alternative. Bill Clinton’s eponymous, “It’s the economy, stupid!”, rings as true today as ever. Herein lies both a paradox for the Tories and an opportunity for Labour. The Conservatives of the last thirty years have retained a deliberate ambition to maintain high levels of unemployment and to limit trade union influence in order to keep wages low and to pacify the demands of workers, thus, as they see it, maximising profit, although this is ultimately self-defeating. For Labour, it should be an open goal, focusing on fair taxation, fair pay, investment in jobs and growth, including their jobs guarantee, should be music to the ears of struggling families – but swimming against the media tide to convince voters remains a tough challenge. Whether it is by design (the Tories) or through insufficient impact (Labour) unless there is a more promising story to tell on the economy very soon we risk a growth of protest party politics that could push the UK toward a democratic train wreck that would render solutions to the economic and social challenges we face ever more unlikely. There are even more serious concentrations of child poverty at a local level: in 100 local wards, for example, between 50 and 70 per cent of children are growing up in poverty. (Child Poverty Map of the UK, End Child Poverty, March 2011). Should Bournemouth Borough Council release more of its mountain of financial reserves? Bournemouth Borough Council has announced that it will release £23M of its financial reserves to “safeguard services and invest in a variety of schemes” and also “lower council tax by 0.7 per cent to ensure residents will not have to pay any extra this year”. Only time will tell whether the funds being released will actually help the people who are directly suffering under the savage austerity measures being implemented by the government. Of course any help that the council can offer to relieve the pressure being felt by hard pressed residents within our area is welcome. However, BPACC calls on the council to look at using the abundance of their reserves still left – around £70M – to plug the hole in government funding for charities and support groups, art and community services, road maintenance, subsidised bus routes and services, renovation of school buildings, legal aid, short break or respite care services, disability services such as mobility shops, stopping increases to car parking charges, social care / community transport etc etc etc…. The Council also needs to answer the question why council tax reserves were not made available for the many cuts we have already seen such as the closures of Darracott Day, Malvern, Horizons day care centres or staff cuts at Boscombe day care centre and more recently the proposed closure of Dorset Enterprise. And lest we forget the cuts / freezes to the wages of many workers employed directly by the council. It can reasonably be argued that as Bournemouth Borough Council is a major employer in the town, cutting or freezing wages or giving below inflation pay increases will have a direct negative effect on the local economy simply because people will be forced to spend less of their earnings within the local community. On top of this, the council has chosen to make hundreds of their employees redundant which has the same effect to the local economy and additionally, due to the unemployment crisis, many of these people will now be in receipt of state benefits and of course no longer paying taxes. A double whammy false economy which although may have a short term positive effect on the council budget sheets, will have long term negative effects upon the local and national economy. 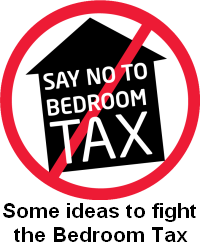 Council Tax Benefit (CTB) – the government has cut the funding to Local Authorities for the provision of CTB by 10%. It has been left entirely up to local Councils how they cover this budget cut. Bournemouth Council has decided that people of working age, except those on DLA – Disability Living Allowance and some Carers, who receive CTB will pay up 20% of their total bill. Crisis / Social Fund Loans and Community Care Grants – the govt has localised these loans / grants and the decision making process of delivering them to some of the most vulnerable people in our community is being handed over to the Council. The funding Local Authorities receive from government will not be ring-fenced, nor will there be a ‘statutory duty’ on local authorities to provide a minimum level of service, nor will there be any ‘sanctions’ if a local authority uses the money to plough into other services. Due to cuts they have already faced, Council staff are already under severe workload pressure and it is highly debatable whether more staff will be employed, so it is very likely that this service will be outsourced. Most people are now becoming aware of the problems this can cause with likes of Mouchel, A4E, G4S, ATOS, Working Links who are happy to take taxpayers money but either unwilling or unable to provide sufficient quality of service or value for money. And as with many other things that are happening, if this service is outsourced, it can be legitimately viewed as back-door privatisation of Jobcentres. Many local public services have already seen their funding from the Council cut and it will be difficult to gauge the effects of these cuts for several years. In most cases, thorough impact assessments have not taken place. As with most policies of this government a hurried swinging axe has fallen down without taking into account the long term hardship and misery it will cause members of our community and the effects it will have on the local / national economy. The govt has set the precedent and unfortunately most Councils are following suit in the way the cuts are being delivered. In most cases the cuts will not ‘help the economy’, in fact they will have the opposite effect and stifle growth causing the country’s economy to continue to flat-line and even that might be considered optimistic. Triple dip recession just around the corner? It could be argued that the Council are caught between a rock and a hard place, as on the one hand they are having their funding cut by central government who conveniently devolve responsible to local authorities as to how the cuts are implemented and have also removed most of the ring-fencing of budgets which gives local authorities free reign regarding services they choose to cut. On the other hand, of course, the Council will not be able to please all the people all the time. However the question begs, how vociferously are our Councils relaying their frustration and anger about the savage nature of these cuts back to central govt or is it more the case that once you scratch the surface of any rhetoric of objection they are happy to go along with the tory ideology of systematically destroying the safety /support network of many within our community. Over the last couple of years, prior to the Council announcing which services will be facing the axe, residents have been asked ‘which services would you like to see cut’. However at a time when they were sitting on around £100M of local taxpayers money (now £70M), perhaps the question the Council should have, and should now be asking, is ‘which services that have already faced budgets cut would you like to see have their funding re-instated’. If you live within Bournemouth Borough and would like to raise any of these issues with your local Councillors, all wards and contact details are shown here. Remember Councillors are elected by you, to serve you; not to blindly follow the decisions or ideology of whichever politically party they have chosen to align themselves with. Specific information about budgets (and funding cuts) allocated to individual organisations is difficult to come by; even via FOIs (Freedom of Information requests). If you are aware of charities or support groups whose budgets have been cut over the last 3 years, please email us at info@bpacc.co.uk and we will look into the matter further. All information received will be treated in the strictest confidence. The UK has experienced the second slowest export growth of all G7 countries since 2010, with only Japan faring worse, the TUC said on Monday 18th February as it published its submission to the 2013 Budget. With the Chancellor identifying an economic ‘global race’ as the defining challenge of the government, the TUC report shows how George Osborne’s own strategy is causing the UK to fall behind its competitors. Recent figures from the International Monetary Fund (IMF) show that over the last two years export growth in the UK has been slower than five of its G7 competitors – the US, Germany, France, Italy and Canada. Only Japan, whose economy is still reeling from the 2010 tsunami and earthquake, is doing worse than Britain when it comes to exports. The Chancellor cannot blame Europe for the UK’s economic woes as the three biggest Eurozone countries are all performing better on exports, says the TUC. In terms of economic growth since 2012, the UK is ranked just 158th of the 184 countries monitored by the IMF. Instead, the TUC believes that a combination of self-defeating austerity and a complete absence of a strategy to grow the economy are dragging the UK down. The TUC Budget submission calls for an immediate stimulus to boost demand. This should include stopping damaging welfare cuts that are reducing people’s living standards – particularly those of low-income families – and reversing cuts in capital spending that have badly affected the construction and housing sectors. But as well as an immediate stimulus, the TUC submission calls for the government to deliver a proper growth strategy, along with stronger tools to deliver it. The Chancellor should start by introducing many of the measures championed by Lord Heseltine in his recent report ‘No Stone Unturned’, says the TUC. This should include an active industrial policy, led by a National Growth Council that would also include business and union representation. The submission also says that the government needs to address another key blockage in the UK economy – a lack of lending to firms outside of finance and real estate. To address this problem the Chancellor should set up a publicly-owned business bank that targets growing industries, such as green technology and high-value manufacturing. In order to work properly, a new business bank should have sufficient capital says the TUC, and suggests £40bn initially over four years. It should also have the ability to raise funds on capital markets. The Budget submission also calls for more action to tackle growing pay inequality which, if left unaddressed, could result in most workers receiving no benefit from future economic growth. The submission proposes tackling soar-away directors’ pay by forcing companies to disclose pay ratios between the lowest, median and best paid company staff, as well as introducing employee representation onto remuneration committees. The Chancellor can also raise revenues by simplifying the tax system through the closure of tax loopholes, says the TUC. This should include aligning capital gains tax with the top rate of tax and strengthening the proposed General Anti-Avoidance Proposal. TUC General Secretary Frances O’Grady said: ‘The UK is currently gripped by two big crises – falling living standards and economic stagnation. For all the Chancellor’s talk of the UK paying its way in the world, his own strategy is dragging the economy down. ‘On growth, exports and investment the UK is falling behind its competitors in Europe and across the globe. In order to address this, the Chancellor must announce a change of direction next month. ‘He can start by taking up Lord Heseltine’s proposal for a new growth council and prioritising new infrastructure projects. It is far better to invest in improving our transport and energy networks than to pay for the costs of economic failure that high unemployment and falling wages bring. ‘But the Chancellor also needs to do more to help families suffering through the UK’s living standards crisis. With real wages falling since 2009, the government has heaped on the pressure by raising VAT, cutting welfare support and freezing pay for public servants.